Watch full One Piece Season 15 Episode 14 English Dubbed full HD online. One Piece Episode 530 English Dubbed online for free in HD. In the open sea, Gyro remembers the time when he was attacked by the New Fishman Pirates and vowing never to return to Fishman Island. 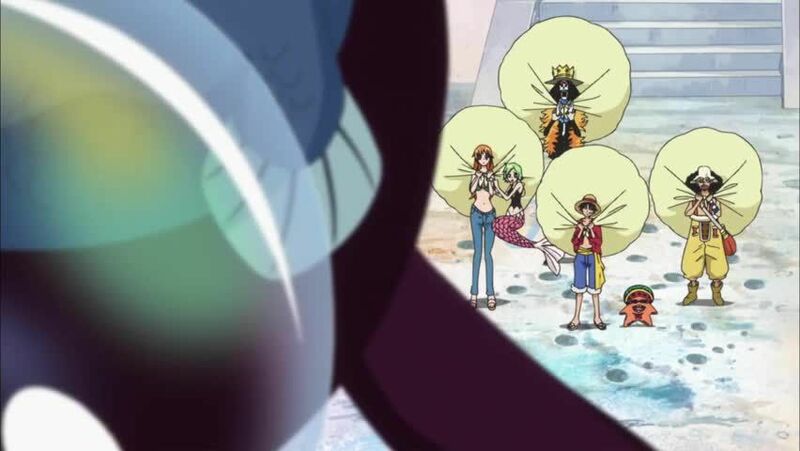 Meanwhile, on Fishman Island, Nami reunites with Luffy, Camie, Pappagu, Usopp, and Brook and the crew gets free merchandise from Pappagu’s shop. Neptune, the island’s king, appears with his whale Hoe and the shark Megalo before them. When Neptune offers the pirates to go to the Ryugu Palace for a banquet, they accept and depart for the palace. Meanwhile, Hordy uses Energy Steroids to destroy Gyro’s ship with his bare hands. Zeo, another one of Hordy’s subordinates, reveals that fishmen have 10 times the strength as humans and an Energy Steroid increases their powers double that for each pill they take. It is also revealed that the humans destroyed the wills of both Fisher Tiger and Arlong. He has his crew go to the island to kill Neptune and make the fishman a superior race.